There are plenty of ways to keep track of changes made to a text document. You can use the track-changes tools built into your word processor (assuming it has them). If your needs are more sophisticated, particularly if you’re collaborating with others, you can use a sophisticated version-control system such as Github, Subversion, CVS. 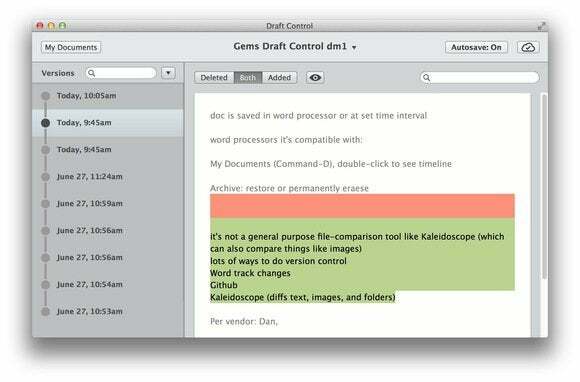 Or you can use a dedicated utility such as Kaleidoscope (which can compare documents, images, and even folders). Should you ever want to roll back to one of those previous versions, you can right-click on the document and select Export This Version of the Document. If you’re exchanging versions of a document with another writer or editor, you can drag those intermediate versions into Draft Control and check the differences there. You can also tell Draft Control to take version snapshots on a schedule (every 10 minutes, say). The utility is compatible with a bunch of different word-processing formats, including Word (.doc, .docx), Pages (.pages), OpenOffice and its variants (.odt), Scrivener (.scriv), Mellel (.mellel), and TextEdit (.rtf), as well as plain text (.txt, .md, .html, and so on). You can also sync document-changes via iCloud, if you work on more than one machine. 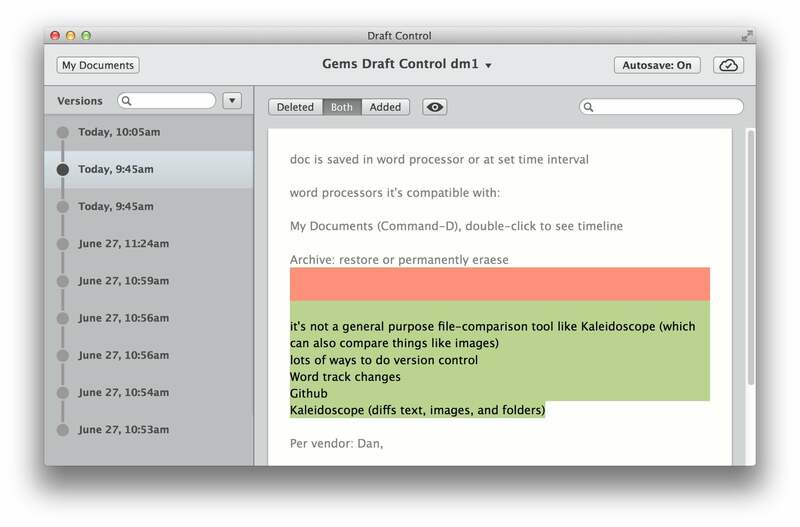 Draft Control is available as a free download from the Mac App Store, but that free version tracks only one document at a time. If you want to track more than one doc, you’ll have to pony up $20 as an in-app purchase. But even then, if you edit lots of text documents and need to keep track of successive drafts, Draft Control is a super-handy, single-purpose utility that belongs in your editing toolkit.